Maurice Combier left the Ardèche département in 1962 and bought property in Pont de l'Isère in the Drôme département to the east. Pont de l'Isère is about 15 kilometres upriver of Drôme's capital, Valence. At that time, the Valence area was France's top fruit hub so Maurice continued his father Camille's tradition of growing fruit. The apricots and peaches were sold to a local fruit cooperative and the grapes to the cooperative in Tain l'Hermitage a few kilometers north. During the 1970's, Maurice began working all of his land organically, rather than spraying his plants with dangerous chemicals and pushing production with synthetic fertilizers. As this was previously unheard of in Crozes-Hermitage (and for that matter, just about all of Europe), he become known locally as Maurice le Fou (Crazy Maurice). But before long, the orchards and vineyards had achieved a balance and were producing even more delicious fruit. Other producers in the area soon followed Maurice's lead. 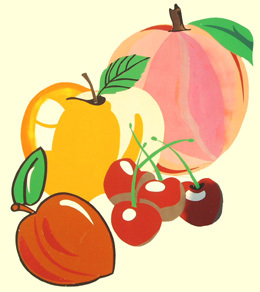 To his delight, Maurice's first son Laurent came into the fold and continued selling their fruit in 1989. Laurent studied viticulture and agriculture in Orange and did apprenticeships at various wine domaines further south, including stints in Châteauneuf du Pape and Domaine d'Ott in Provence. Maurice and Laurent decided to leave the cooperative the next year and set off on their own. They established their own fruit brand called Combier, whose organic peaches and apricots are available throughout much of France. They also began bottling their own wine from vineyards surrounding the house. Slowly Laurent started expanding the cellar, finally constructing an underground chai where all his vinification and aging now takes place. The domaine now comprises 20 hectares (49.4 acres) of vines, of which 90% are red. Albert Begot was a well-respected grower in the northern part of the appellation and a family friend. When he retired several years ago, Laurent came to a rental agreement with him and now produces abistro blend made with the organic fruit that he works himself. ​The vineyard produces just under 3 tons of fruit an acre and sees a 25-day cuvaison in stainless steel. After its malolactic, it goes into either well-seasoned oak (that has seen three or four wines) or into an incredible aging vessel known simply as an œuf (egg). 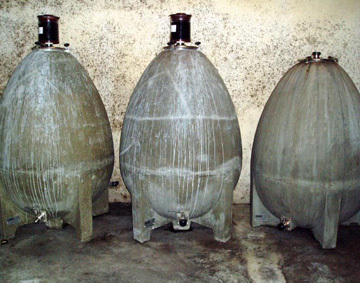 Made from cement and holding 6 hl of wine (600 liters or about 2 1/2 barrels), eggs provide the benefits of cement tanks (cooler temperatures without the expenditure of electricity), yet for much smaller lots. Once called Cuvée L and now simply Laurent Combier, this wine has an attractive purple label and shows the primary fruit side of Syrah, whose light peppery underpinnings make it ideal to consume in its youth with classic bistro fare. Some day all aging vessels will be called eggs! The fruit for the Domaine Combier cuvée comes from a number of different sites in and around Pont de l'Isère. 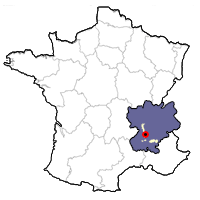 In the town of Gervans, two vineyard sites — Cafiot and La Tuilière — have soils combining sandy soil with some granite, whereas another parcel near the Rhône river, Les Iles, contains small, round stones. Still another parcel, Les Garennes, is predominantly silt. Like all the cuvées on the property, the fruit is harvested by hand with yields at around 40 hl / ha (just over 2 1/2 tons to the acre). The grapes are completely destemmed, then pass a 25-day fermentation period in stainless steel with pump-overs a couple times a day and some punch downs. All of the wine goes into barrels that have previously seen two or three wines. Malolactic takes place in oak, and the wine rests in cask for twelve months. The wine is minimally sulphured and filtered ever so lightly. Laurent's top cuvée is Clos des Grives, from a hedgelined, enclosed vineyard located just east of the domaine and next to the property of winemaker Alain Graillot. The soil is rich with red clay and chalk, along with plenty of alluvial stones. The 4 1/2 hectares of Syrah were planted in 1954. Yields are low, about 30 hl / ha or 2 tons to the acre. The upbringing is similar to that of Domaine Combier, apart from the fact that he uses 25% new oak for the cuvée, while the rest goes into oak that has previously seen one or two wines. A couple of white wines are also made at the property, incorporating Marsanne and Roussannegrapes. The Domaine Combier cuvée is made with 80% Marsanne and 20% Roussanne, harvested at approximately 42 hl / ha (just under 3 tons an acre). 70% is aged in temperature controlled stainless steel, while 30% is fermented and aged in new oak. The wine goes through its malolactic and is bottled with a light filtration. 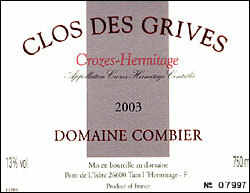 The Clos des Grives white is made with the opposite blend: 80% Roussanne and 20% Marsanne. 80% is fermented and aged in new oak, and 20% goes into wood that has seen one wine. The wine passes its malo and is bottled after a light filtration. "I search for a purity of fruit, above all," Laurent Combier states when talking of his wines. "Syrah is a grape of finesse, and in hotter climates of the new world, this finesse is often difficult to achieve. That's one advantage that we have in the northern Rhône." 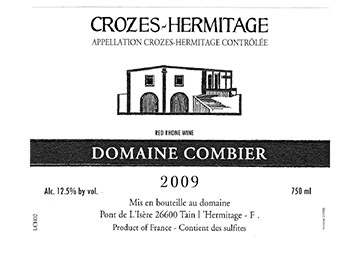 As if running an agricultural and viticultural domaine weren't enough, in 2002 the busy Combier bought a 13-ha (32-acre) domaine in Priorat, Spain, along with Côte Rôtie producer Jean-Michel Gerin and Peter Fischer from Château Revelette in Coteaux d'Aix-en-Provence. So in between the day's fruit market fluctuations (Laurent states during the season he alternatively has two or three phones going to inform customers of the day's ups and downs) or directing his three-man team in the vineyards, Laurent might hire a plane which he himself pilots to Taragona to then work in his Spanish vineyards. With his wife taking care of the administrative side of the business, Domaine Combier is still a small, family-run affair. Wine makes up 60% of the financial intake, with the fruit side not far behind. "My father once had the dream to make the farm completely self-sustaining, making bio-fuel with the help of the animals on the farm," Laurant says. "But now that we don't have cows anymore, that's somewhat difficult." I suggest solar power, and Laurent turns to me with a twinkle in his eye as if he's already begun thinking of that possibility. Tasting Notes: Opaque color. Wonderful nose combines black fruits, violet, pepper, spice, vanilla and a touch of smoke. New oak flavors lift the wine well. Dense and long. Almost more Hermitage than Crozes. Tasting Notes: Lots of oak on the nose, with some dried apricot and spice lingering in the background. Still young, develops nicely with time. Tasting Notes: Deep ruby color. Concentrated raspberry, pepper and violet aromas. Medium-to-full body with a supple texture and good acidic structure. Lovely pure Syrah flavors from the Northern Rhône. Tasting Notes: Wildly aromatic nose combines flowers, dried fruits, vanilla, spice and exotic citrus fruits. Medium-to-full body. Perfect acidity for drinking in its first year or two of life. Tasting Notes: Bright red berry / raspberry-scented fruit with plenty of crushed black pepper notes. Medium body with bright acidity. Good versatile, everyday Crozes.